I have this friend of mine who wanted her son to eat more legumes and who had issues with chickpeas, kidney beans etc and that all he ends up eating is potato curry this, potato curry that! I told her why not add chickpeas to potatoes and she said she tried that too but he wont and he is going to miss out on protein. 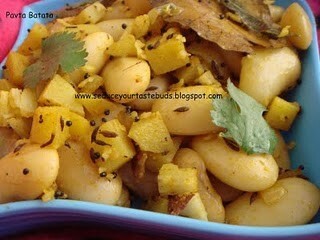 She challenged me to make him eat legumes and which I took up with this "Pavta Batata". I won the challenge hands down and her son finished off an entire bowl of 'yellow sabzi'all by himself! 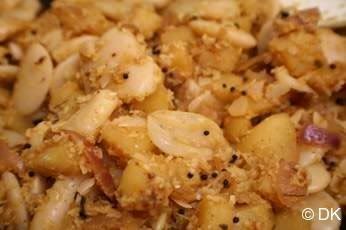 Well the credit goes entirely to this Maharashtrian dish ;-) which makes everything simple. 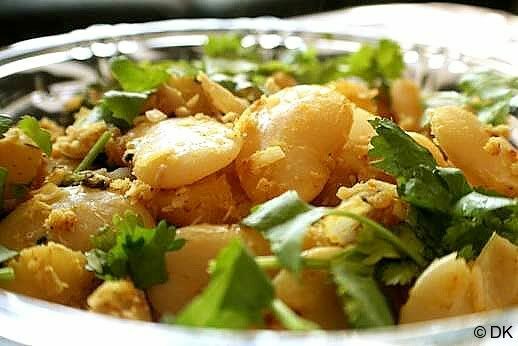 It is one dish to make staple in your kitchen. 1. In a non stick pan, heat 1/2 tsp oil, add the mustard seeds. 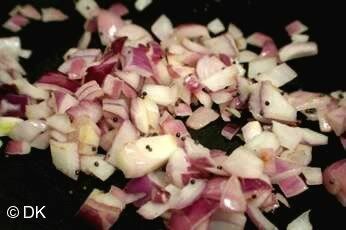 When they start popping add the onion and asafoetida. 2. 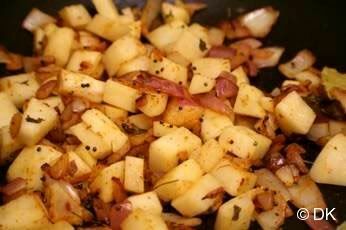 Once the onions are soft, add the spices, potato and salt. Add little water, cover the pan and let it cook until potatoes are soft. 3. Gently add in the cooked beans along with coconut and cilnatro. Lil angel was the first to taste it and had a bowl of just this dish and refused to eat rice.Hubby who had it with his lunch enjoy it even more and finished the bowl all by himself sharing a little with MIL! I would be trying this often..Thanks for sharing such a wonderful recipe..
Hi D & K, Assuming this post is by D :wink: . Liked the assurance with which you took up the challenge of making kids eat healthy food. I agree, it does not take much more than thinking on your feet to come up with tasty and friendly recipes. Enjoyed coming here. Hi, I visited your site first time today...very nice and innovative recipes i liked the vegetable pot pies recipe..and though i m Maharashtrian living in tokyo I had forgot Pavta as we dont get it here..but I will search and try making patvta batata as well! thanks for reminding me it. Jay maharashtra :wink: Keep writing! I also use lima beans a lot DK. I generally use the frozen green ones. Have not tried the dried ones so far. This one looks like a good combination too. Do you by any chance know the english name for Mochai paruppu? I googled and couldn't find it. this looks good and is healthy too, will be trying it out soon! Nice variation with lima beans.. Will try this one. I sent you my entry for A.W.E.D, pls let me know if you received or if you want me send again.. Thanks..